An ECI project, for information on our other work please click here. 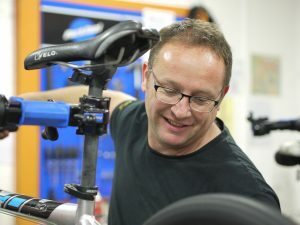 To create a supportive workshop environment where vulnerable adults can learn practical skills in refurbishing bikes for the benefit of others. These are our Trainee Mechanics. To offer refurbished bikes to people at affordable prices for well-being, exercise or as a means to get to work. Many bikes will be made available at minimum cost via a voucher system similar to that used by Food Banks. We can be found at Exeter Bike Workshop in Market Street, with our charity partners Julian House. The Bike Bank is run by Andy Southcott and is supported by a team of volunteer mechanics. These are people with an interest and some experience of bicycle maintenance as well as the capacity to support and mentor others. Why we set up the Bike bank? We recognise that there are an increasing number of people who want to be involved in meaningful occupation but there are few opportunities. Some people may have very high needs but they want the chance to do something for others. The focus on ‘hands on’ learning in a supportive environment creates something very powerful for people. To find out more about our Trainee Workshop Programme which offers practical skills in bike repair contact Carole on 01392 284280 or click here for more information and an application form. At the Bike Bank we run a referral scheme for those that would benefit from the use of a bike at a discounted price. Referrals must be made by an appropriate agency. Bike Bank is run by Exeter Community Initiatives, a dynamic charity in Exeter and Devon, which helps people get their lives back on track. We involve them in community projects to improve their mental, emotional and physical wellbeing, increase their sense of belonging and offer skills to help them succeed in life. Through our work we challenge inequality, homelessness and poverty.